English director Mike Leigh makes the sort of movies that are easily nominated for Academy Awards but never win any, that is, the sort of movies Hollywood knows it is supposed to appreciate but mostly does not. 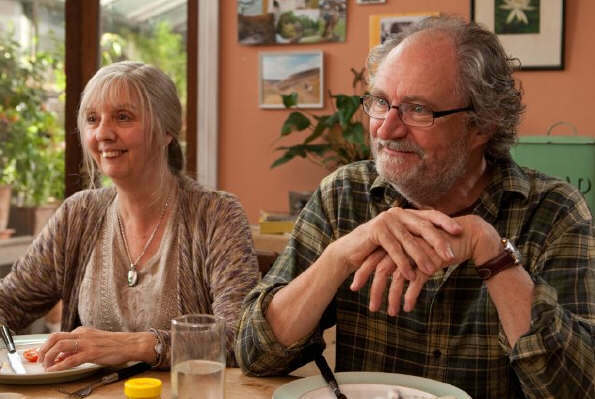 Leigh's latest film, Another Year, revisits some terrain similar to the earlier, highly decorated Secrets and Lies (five nominations, no Oscars), in a way that prompted our film contributor Todd Babcock to joke that the movie's title should be Another [Mike Leigh] Year. Leigh's working method is as well-known as it is unusual, a process by which the actors improvise the lines of the screenplay: as they rehearse and film scenes, they have usually received from Leigh some background on who their character is but often none of the specifics of what may happen. The goal is dialogue that sounds less like dialogue and more like conversation, but the result is a movie paced less like a well-planned drama and more like a slightly disordered life. Another Year is centered on the warm home of the equally warm couple Tom (Leigh favorite Jim Broadbent, of Topsy-Turvy, among other Leigh films, which was thrown a bone with Oscars for costumes and makeup) and Gerri (Ruth Sheen). Over the course of four seasons, their contented, loving marriage is the only point of solace, helped along by an easy-going original score by Gary Yershon, among a number of less fortunate friends and hangers-on drawn to their generosity, their well-tended "allotment" (a garden plot that they happily visit throughout the film -- Il faut cultiver notre jardin is the obvious, Voltaire-inspired moral), and their well-appointed table. As in Secrets and Lies, much of the plot is driven by interactions in a government office, where Gerri works as a counselor. (I was totally fooled by Leigh favorite Imelda Staunton, the star of Vera Drake -- three nominations, no Oscars -- who had an intriguing couple of scenes with Gerri at the opening of the film but turns out to be a dead end character.) Like most Leigh films, there is a proximity between poor and middle class, who overlap through various connections, a situation that Leigh has said resembles his own upbringing. The most important character drawn to Tom and Gerri is Mary, who works at the same office as Gerri, but who has a completely different life: a divorce and a series of failed relationships, a problem with drinking, a lack of responsibility or normality. As played magnificently by Lesley Manville, Mary is a wreck of a woman, who desperately craves companionship and comforts of home but has no idea how to find them, or at least no luck in doing so. It is a performance reminiscent in many ways -- pathos, desperation, plainness -- of Brenda Blethyn's role in Secrets and Lies, and one feels torn between moments of empathy and disdain for Mary. With increasingly nervous agitation, she attempts to insinuate herself into Gerri's family, throwing herself somewhat desperately at Tom and Gerri's adult son, Joe (Oliver Maltman), only to be visibly angered when introduced to his new girlfriend, Katie (Karina Fernandez). Tom and Gerri also receive a visit from Ken, an old friend of Tom's from Hull, whose drinking and smoking and lack of exercise are on the verge of killing him. Seemingly suited perfectly to Mary, he throws himself at her rather desperately, when thoroughly drunk, as she is dropping him off at the train station. The outlook of this world is understandably bleak, a worldview seemingly formed by existentialist thought. Do the less fortunate characters wallow in their private hells because of the choices they have made in their lives? Although obviously the happiest, neither Tom nor Gerri is presented as being without fault, especially as they seem to enjoy their misfit friends to some degree, even to the point of being entertained by them. There is no easy answer, as there is not in most lives, and that is what makes Leigh's films so often rewarding to watch, and infuriating to some. It is why Leigh has won the Palme d'Or, the Leone d'oro, and the Best Director award at Cannes, and likely why an Academy Award will continue to elude him. Best Recordings of 2010 - "Almost List"